Simple and enjoyable for a few minutes, but there's little variety. 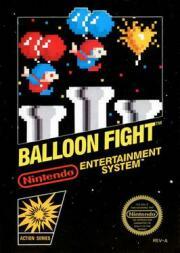 Nintendo does "Joust". It's cute and playable for a while. Remains one of the more charming and playable of the proto-NES era of arcade-style single-screen games. All revolves around one basic mechanic but it's a mechanic that keeps the pace brisk and enjoyable, with fun versus multiplayer and even a kind of pleasant mood with its nighttime settings that makes it a good game to zone out to in the twilight hours.